Workplace health programs have been touted as a way to reduce employee medical costs, but employees in the program studied spent $566 a month on health care compared to $562 a month in the control group. Spurred in part by incentives in the 2010 Affordable Care Act, the workplace wellness industry has more than tripled its annual revenues, to $8 billion, in recent years. Wellness programs now cover more than 50 million American workers. But a new study of one large program finds little evidence that it paid off in lower medical expenditures or greater workforce productivity. In What Do Workplace Wellness Programs Do? Evidence from the Illinois Workplace Wellness Study (NBER Working Paper No. 24229), Damon Jones, David Molitor, and Julian Reif examine the impact of a wellness program they designed and implemented at the University of Illinois at Urbana-Champaign. 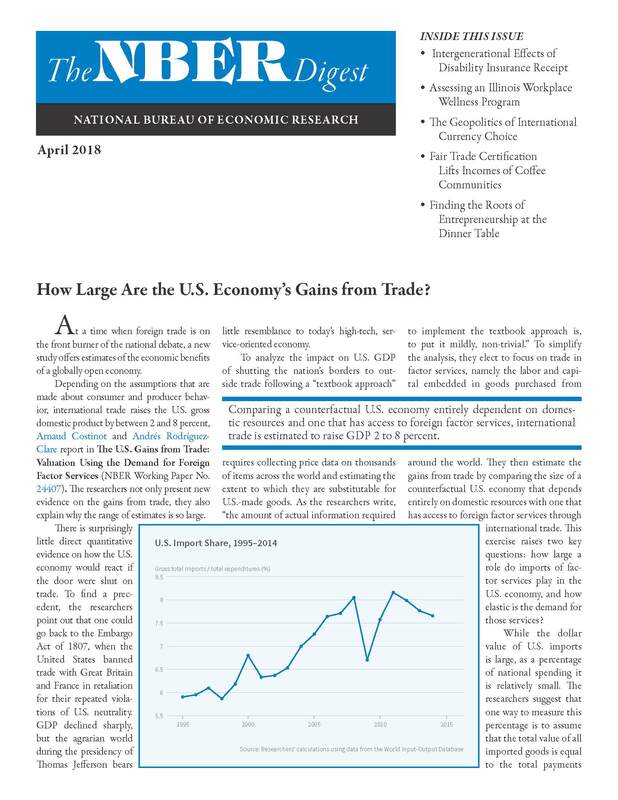 How Large Are the U.S. Economy's Gains from Trade? Of 12,459 benefits-eligible employees invited to participate, 4,834 opted to do so. They were divided into a treatment group of 3,300 people who were offered the opportunity to enroll in the wellness program and to participate during regular work hours, and a randomly assigned control group of 1,534 people who were not permitted to enroll. As an incentive to complete various steps in the program — which included biometric health screening, a health risk assessment, and various wellness activities — participants were offered rewards of between $50 and $350. The amounts were randomly assigned and announced at the outset. Raising incentives, the study found, resulted in sharply diminishing returns. Introducing a $100 reward boosted the completion rate by 12 percentage points, from 47 percent to 59 percent; further increasing the reward to $200 raised participation by only 4 percentage points. As a matter of policy, the researchers write, "increasing a large financial incentive to even greater levels will transfer large sums of money to workplace wellness program participants, but will have little effect" on levels of participation. Tying rewards to completing downstream wellness activities was more cost-effective than providing up-front incentives to undergo the initial screening. Health programs have been touted as a means of reducing employee medical costs and raising productivity by, for example, decreasing absenteeism. 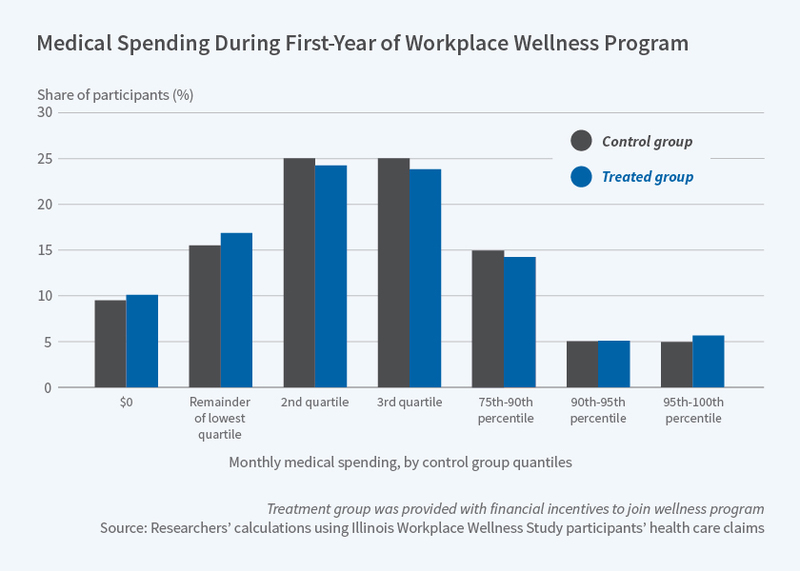 In the first year of this randomized study, however, employees in the wellness program spent on average $566 a month on health expenditures compared to $562 a month in the control group. The study also found evidence of self-selection: Among employees in the treatment group, those who chose to participate in the wellness program had annual medical expenditures that were $1,574 less than those of nonparticipants. Participants were also more likely than the average worker to have exercised at campus recreational facilities and entered community running events. Based on follow-up survey responses, there were only two significant differences between those enrolled in the wellness program and those in the control group. First, employees in the treatment group were more likely to report having received a health screening, suggesting that some otherwise would not have obtained one. Second, those in the treatment group were much more likely to credit management with looking out for worker health and safety. While designed to promote healthy lifestyles, wellness programs may undermine workplace equity, the researchers caution. The Affordable Care Act promotes wellness programs by allowing employers to offer participation incentives worth up to 30 percent of the total cost of health insurance. If healthier individuals are more likely to participate and to benefit from these incentives, nonparticipants may wind up bearing a greater burden of the cost of health care. This is of particular concern, the researchers note, because nonparticipants are more likely to be in the lower ranks of the salary distribution. The researchers also caution that their findings are based on only a single year of experience with the wellness program, and that ongoing follow-up in coming years will lead to a more complete understanding of its effects.